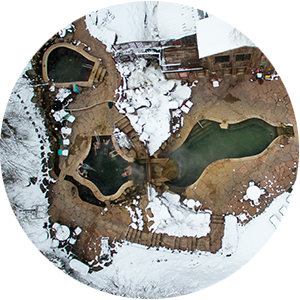 Designed around the natural landscape and rock formations of our dramatic Crystal River Valley, Avalanche Ranch features 3 Colorado natural hot springs pools in a tiered layout. 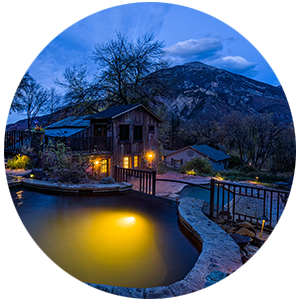 The three Colorado hot springs on our property provide year-round, day and night availability to our Colorado vacation cabin guests and limited paid public access by reservation. The pools are CLOSED WEDNESDAYS for cleaning. They open for lodging guests Wednesday evening after 5pm. The Hot Springs entry fee is included in the nightly rate, for the number of registered guests per unit, from check-in(after 3pm) to check-out(at 11am). Open around-the-clock. Closed Wednesday from 9am-5pm for cleaning. Clothing required, family friendly, no pets in pool area, no glass and no smoking. The Hot Springs are not a venue for parties, music and excessive drinking. All lodging guests and day visitors must sign a waiver to use our facilities. With views of Mt. 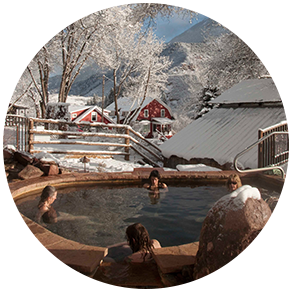 Sopris, Elephant Mountain, and Avalanche Creek Valley, a more pristine area to reap the benefits of an outdoor hot mineral bath is hard to find.